Ichiro played in the field in the top of the first, but was pinch hit for in the bottom of the first. PEORIA, Ariz. — It was the baritone voice of the public address announcer at Peoria Stadium that notified everyone of the unexpected change to start the bottom of the first inning. “Now pinch hitting for the Mariners in place of Ichiro … Number, 57, John Andreoli,” the voice boomed over the speakers. Wait, a pinch hitter for Ichiro in the first at-bat of the game? 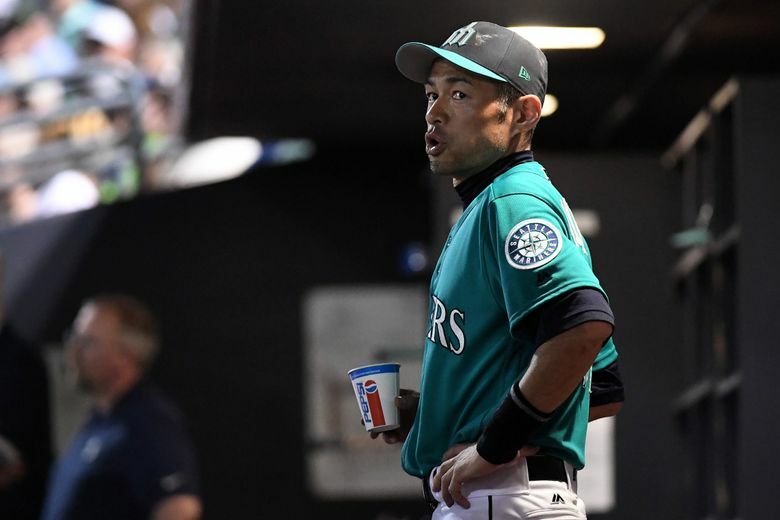 Did something happen from the time Ichiro stood in left field, watching starter James Paxton strike out the side in the top of the first to when he ran in from his position to the dugoout at the end of the inning? Well, apparently his right calf had tightened up. And the Mariners, with a list of injured players longer than a 4 p.m. buffet line in Peoria, decided not to take any chances and removed him from the game. In the top of the fourth inning, Jean Segura was pulled from the game with right hamstring tightness. In the bottom of the third, Segura sprinted from first to third on a single from Mitch Haniger. After the inning ended, he was replaced in the lineup by Danny Muno. They are the 1oth and 11th players on the Mariners’ 40-man roster to deal with some sort of known injury issue. Ichiro’s seems the most minor while Segura dealt with hamstring issues early last season. Update: First on-field batting practice on Wednesday. Could play in a Cactus League game by this weekend. Update: Playing catch on flat ground. Hasn’t begun long tossing yet. The hope is he can make it back by second week in April. Update: Shutdown from baseball activities. Likely to miss the first 2-3 weeks of the regular season. Update: Threw a 25-pitch bullpen on Tuesday. He will throw another bullpen on Friday and then a Cactus League start likely Monday or Tuesday. Update: Gonzales will throw a bullpen on Thursday, but likely won’t be able to catch the ball when the catcher throws it back. He believes he’ll make his scheduled start on Saturday. Update: The Grade 1 strain is minor. He will likely return to games by the middle of next week. Update: Also a Grade 1 strain. Cruz plans to take 2-3 days off from baseball activities and return to game action next week. Update: Felt the shoulder partially come out of socket. He’ll take 2-3 days off and return to games by next week. Update: Left Wednesday night’s game in the first inning. He played in the field for the top of the inning and then was pinch-hit for. Update: Exited Wednesday’s game in the top of the fourth after going first to third in bottom of the third on a single. Dealt with hamstring issues early last season as well.